Chronic lymphocytic leukemia (CLL) results from the expansion of malignant CD5+ B cells that usually express IgD and IgM. These leukemic cells can give rise in vivo to clonally related IgG+ or IgA+ elements. The requirements and modalities of this process remain elusive. Here we show that leukemic B cells from 14 of 20 CLLs contain the hallmarks of ongoing Ig class switch DNA recombination (CSR), including extrachromosomal switch circular DNAs and circle transcripts generated by direct Sμ→Sγ, Sμ→Sα, and Sμ→Sε as well as sequential Sγ→Sα and Sγ→Sε CSR. Similar CLL B cells express transcripts for activation-induced cytidine deaminase, a critical component of the CSR machinery, and contain germline IH-CH and mature VHDJH-CH transcripts encoded by multiple Cγ, Cα, and Cε genes. Ongoing CSR occurs in only a fraction of the CLL clone, as only small proportions of CD5+CD19+ cells express surface IgG or IgA and lack IgM and IgD. In vivo class-switching CLL B cells down-regulate switch circles and circle transcripts in vitro unless exposed to exogenous CD40 ligand and IL-4. In addition, CLL B cells that do not class switch in vivo activate the CSR machinery and secrete IgG, IgA, or IgE upon in vitro exposure to CD40 ligand and IL-4. These findings indicate that in CLL at least some members of the malignant clone actively differentiate in vivo along a pathway that induces CSR. They also suggest that this process is elicited by external stimuli, including CD40 ligand and IL-4, provided by bystander immune cells. Chronic lymphocytic leukemia (CLL)3 derives from the clonal expansion of CD5+ B cells that in general express IgD and/or IgM (1). These Igs were initially reported as encoded by virtually unmutated Ig V(D)J genes (2, 3, 4, 5), suggesting that CLL originates from a naive CD5+ B cell progenitor that has not transited through the germinal center (GC) (6, 7, 8, 9). This long-held view has been modified by a number of reports showing that CLL encompasses two biologically and clinically distinct entities, one characterized by the expression of germline V(D)J genes and a worse prognosis, and the other characterized by the expression of hypermutated V(D)J genes and a better prognosis (10, 11, 12, 13, 14, 15, 16). More recent studies indicate that regardless of their Ig V(D)J genotype, CLLs share an overall gene expression profile similar to that of memory B cells (17, 18). The CLL phenotype remains controversial mainly because of its heterogeneity. Interclonal heterogeneity could reflect the origin of CLLs from distinct normal B cell precursors or the different activation pathways followed by a single normal B cell precursor. Intraclonal heterogeneity could derive from the occurrence of spontaneous genetic alterations in some, but not all, members of the CLL clone after the initial transforming event. Intraclonal heterogeneity could also stem from the in vivo interaction of some, but not all, members of the CLL clone with bystander immune cells. Consistent with this, some CLLs undergo intraclonal Ig V(D)J and bcl-6 gene diversification in vivo (11, 12, 19, 20). The in vivo plasticity of CLL is further underscored by reports showing that IgM+ leukemic cells can give rise to clonally related IgG+ or IgA+ elements, possibly through a process of class switch DNA recombination (CSR) (12, 21, 22, 23, 24, 25, 26). It remains unknown whether class switching occurs at a specific time point during the evolution of the neoplastic clone or results from the continuous in vivo activation of the leukemic CSR machinery by external stimuli. These stimuli would include CD40 ligand (CD40L) and IL-4, two CD4+ T cell-derived molecules that elicit Ig class switching in both normal and neoplastic B cells (27, 28, 29, 30). CSR occurs through an intriguing mechanism that requires the putative RNA editing enzyme, activation-induced cytidine deaminase (AID) (31, 32, 33). By activating the IH promoter upstream of the targeted CH gene, engagement of the CD40 and IL-4 receptors on B cells induces the production of germline IH-CH transcripts, which, in turn, facilitate recombination of the switch (S)μ region with the targeted downstream S region (27, 29, 30, 33, 34). This yields to CSR through looping-out deletion of the genomic DNA between the recombined S regions (34) and generates an extrachromosomal reciprocal switch DNA recombination product, also known as the switch circle (SC), which includes the IH promoter upstream of the targeted S region, the DNA segment between Sμ and the targeted S region, and Cμ (35). Under the influence of the IH promoter, the SC transcribes a chimeric I-Cμ product, referred to as the circle transcript (CT) (36). Since SCs are rapidly degraded by nucleases, both SCs and CTs constitute specific molecular markers of ongoing CSR (36, 37). The presence of ongoing CSR in CLL B cells remains elusive. We show here that leukemic B cells from the majority of CLL patients contain SCs as well as CTs deriving from ongoing direct or sequential CSR to Cγ, Cα, or Cε. These CLL B cells down-regulate CSR in vitro unless exposed to exogenous CD40L and IL-4. In nonactively class-switching CLL B cells, the CD40 and IL-4 receptors are functional and retain the ability to induce CSR. These findings indicate that at least some members of the CLL clone actively differentiate in vivo along a GC-like pathway that includes CSR. This ongoing differentiation may reflect the in vivo exposure of leukemic cells to external stimuli, such as CD40L and IL-4 provided by normal bystander immune cells. Leukemic cells were isolated from the peripheral blood of 20 untreated CLL patients. The diagnosis of CLL was established according to standard criteria that included the expression of CD5, CD19, and CD23 by an expanded B cell clone (38). All blood samples were obtained by phlebotomy upon request of the patient’s physician according to an institutional review board protocol. Normal peripheral blood B cells were isolated from buffy coats provided by the New York Blood Center. Both normal and leukemic B cells were enriched from mononuclear cells upon T cell depletion (39). Enriched nonmalignant B cells were purified using MicroBeads conjugated with an Ab to CD19 (Miltenyi Biotec, Auburn, CA). Leukemic B cells were enriched by incubating total B cells with an FITC-conjugated mouse mAb to CD5 (Beckman Coulter, Miami, FL) and anti-FITC MicroBeads (Miltenyi Biotec). Normal IgD+CD38−, IgD+CD38+, IgD−CD38+, and IgD−CD38− B cell subsets were sorted from tonsillar mononuclear cells as previously described (27). Genomic DNA was extracted from B cells using the QIAmp DNA Mini kit (Qiagen, Chatsworth, CA) (27). SCs were amplified from 500 ng of genomic DNA using a previously described nested PCR strategy (27). The conditions were denaturation for 1 min at 94°C, annealing for 1 min at 68°C, and extension for 4 min at 72°C for two rounds of 30 cycles. Before each PCR, DNA was denatured for 5 min at 94°C. The identity of PCR products with SCs was confirmed by DNA sequencing. Genomic β-actin was amplified as previously reported (27). Total RNA was isolated from B cells using the RNeasy Total RNA kit (Qiagen). RNA (2 μg) was reverse transcribed using the reverse transcriptase Superscript and a poly(dT)12–18 primer (Invitrogen, Carlsbad, CA) (27). Iγ-Cμ, Iα-Cμ, and Iε-Cμ CTs were RT-PCR amplified for 30 cycles using the reverse primer Cμ (5′-GTTGCCGTTGGGGTGCTGGAC-3′) together with the forward primers Iγ (5′-GGGCTTCCAAGCCAACAGGGCAGGACA-3′; this primer recognizes Iγ1 and Iγ2), Iα (5′-CAGCAGCCCTCTTGGCAGGCAGCCAG-3′; this primer recognizes both Iα1 and Iα2), and Iε (5′-GACGGGCCACACCATCCACAGGCACCAAATGGACGAC-3′). Iα-Cγ and Iε-Cγ CTs were RT-PCR amplified for 30 cycles using the Cγ reverse primer (5′-CAAGCTGCTGGAGGGCACGGT-3′), which recognizes a sequence shared by all Cγ regions, together with the forward primers Iα (5′-CAGCAGCCCTCTTGGCAGGCAGCCAG-3′) and Iε (5′-GACGGGCCACACCATCCACAGGCACCAAATGGACGAC-3′). IH-CH, VHDJH-CH, and β-actin were RT-PCR amplified for 25 cycles using the primer pairs previously described (27, 28, 40). Iε-Cε, VHDJH-Cδ, and AID, were RT-PCR amplified for 25 cycles using the following primer pairs: Iε forward, 5′-GACGGGCCACACCATCCACAGGCACCAAATGGACGAC-3′; and Cε reverse, 5′-CAGGACGACTGTAAGATCTTCACG-3′; VHDJH forward, 5′-GACACGGCTGTGTATTACTGTGCG-3′; and Cδ reverse, 5′-GGAGAGCTGGCTGCTTGTCATG-3′; AID forward, 5′-TGCTCTTCCTCCGCTACATCTC-3′; and AID reverse, 5′-AACCTCATACAGGGGCAAAAGG-3′. The PCR conditions were denaturation for 1 min at 94°C, annealing for 1 min at 68°C, and extension for 1 min at 72°C. Before each RT-PCR, cDNAs were denatured for 5 min at 94°C. PCRs were made semiquantitative by performing dilutional analysis so that there was a linear relationship between the amount of cDNA used and the intensity of the PCR product. PCR products were fractionated onto agarose gels, transferred overnight onto nylon membranes, and hybridized with specific labeled probes (27). 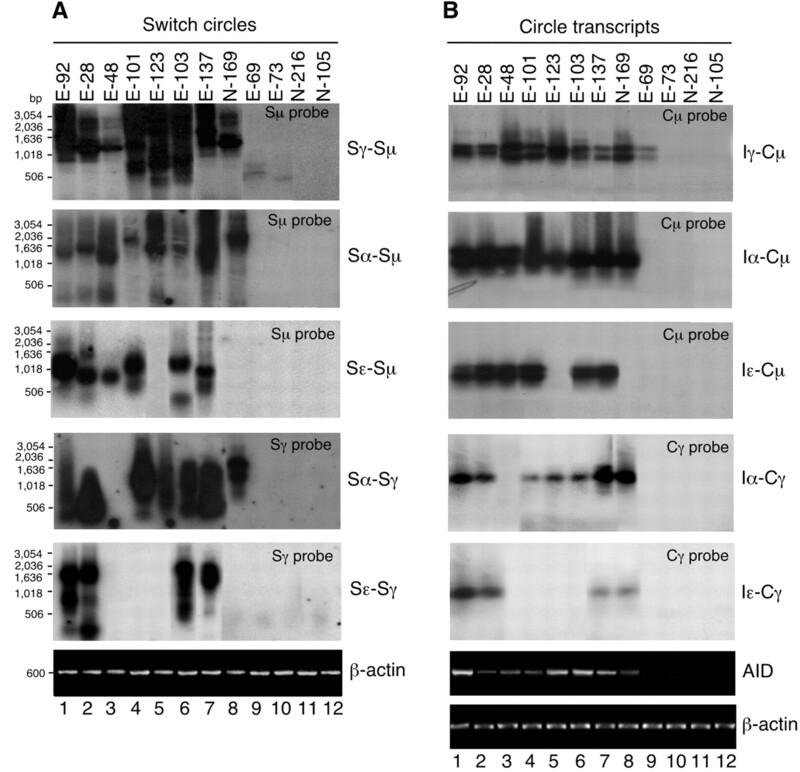 Sγ-Sμ, Sα-Sμ, and Sε-Sμ were hybridized with a probe recognizing the recombined Sμ region, whereas Sα-Sγ and Sε-Sγ were labeled with a probe recognizing the recombined Sγ region. Hybridization products appear smeary on gel electrophoresis, as each switching B cell produces a single copy SC with a unique size. Iγ-Cμ, Iα-Cμ, and Iε-Cμ were hybridized with a probe encompassing nt 1–250 of the first Cμ exon. Iα-Cγ and Iε-Cγ were hybridized with a probe encompassing nt 1–200 of the first Cγ exon. CLL VHDJH transcripts were identified by SSCP (41). Briefly, cDNAs were PCR amplified with Taq DNA polymerase (Life Technologies, Gaithersburg, MD) using the cloned cDNA inserted into pCR-Blunt II-TOPO vector as template. The internal VH leader sense primer and JH antisense primer were used for VHDJH analysis. Samples were denatured and immediately loaded onto a pre-cast polyacrylamide gel (GeneGel Excel 12.5/24 Kit; Amersham Pharmacia Biotech, Piscataway, NJ). Fractionated cDNAs were silver stained using a PlusOne DNA Silver Staining Kit (Amersham Pharmacia Biotech). Ig VHDJH transcripts were sequenced as previously reported (41), and sequences were compared with the germline counterpart and with the original CLL VHDJH sequence using Mac Vector version 5.0 software (International Biotechnologies, New Haven, CT). CLL B cells were cultured in six-well plastic plates with 5 ml of RPMI 1640 medium supplemented with 10% heat-inactivated FBS (Life Technologies), 2 mM l-glutamine, 100 U/ml of penicillin, and 100 μg/ml of streptomycin. Human trimeric (ht) CD40L (Immunex, Seattle, WA), IL-4, and IL-10 (Schering-Plough, Kenilworth, NJ) were used at 1 μg/ml, 250 U/ml, and 200 ng/ml, respectively. mAbs to CD5, CD19, CD71 (Beckman Coulter), CD38, CD138 (BD PharMingen, San Diego, CA), IgD, IgM, IgA, and IgG (Southern Biotechnologies Associates, Birmingham, AL) were conjugated with FITC or PE. CD77 was labeled with an unconjugated mouse mAb (Beckman Coulter) and a PE-conjugated Ab to mouse Igs (BD PharMingen). Cells were acquired using a FACSCalibur analyzer (BD Biosciences, San Jose, CA). Secreted IgM, IgG, IgA, and IgE were detected by standard ELISAs (27). After cell lysis (40), total proteins were pulled down with a GST-CD40 intracytoplasmic (GST-CD40IC) fusion protein (from Dr. V. M. Dixit, Genentech, South San Francisco, CA) reacted with glutathione-agarose beads (Sigma, St. Louis, MO). Pulled-down proteins were fractionated on 10% SDS-PAGE and transferred to nitrocellulose membranes. After blocking, membranes were immunoblotted with Abs to TNFR-associated factor-2 (TRAF-2) or TRAF-6 (Santa Cruz Biotechnology, Santa Cruz, CA). Proteins were detected with an enhanced chemiluminescence detection system (Amersham, Little Chalfont, U.K.). To perform solid phase IκBα kinase (IKKα) assays, an IκBα-GST fusion protein (from Dr. M. Karin, University of California, San Diego, CA) was reacted with glutathione-agarose beads and incubated for 15 min with total cell lysates, kinase buffer, and [γ-32P]ATP. Following extensive washes, phosphorylated IκBα was boiled in SDS sample buffer, and eluted proteins were run on a 15% SDS-PAGE. Phosphorylated IκBα was detected by autoradiography. B cells were cultured for 6 h, and nuclear proteins were extracted using a modified version of Schreiber’s method (30). Double-stranded oligonucleotide probes encompassing the κB1 and STAT-6 binding sites within the germline Cγ3 gene promoter were prepared as previously described (30). These probes were labeled with [α-32P]dCTP and [α-32P]dGTP using the Klenow fragment of DNA polymerase I (Roche, Indianapolis, IN). DNA binding reactions and shift assays were performed as previously reported (30). In healthy subjects, IgD+CD38− and IgD−CD38− B cells account for ∼85 and 15% of peripheral blood B lymphocytes, respectively, and include naive and memory B cells (42). 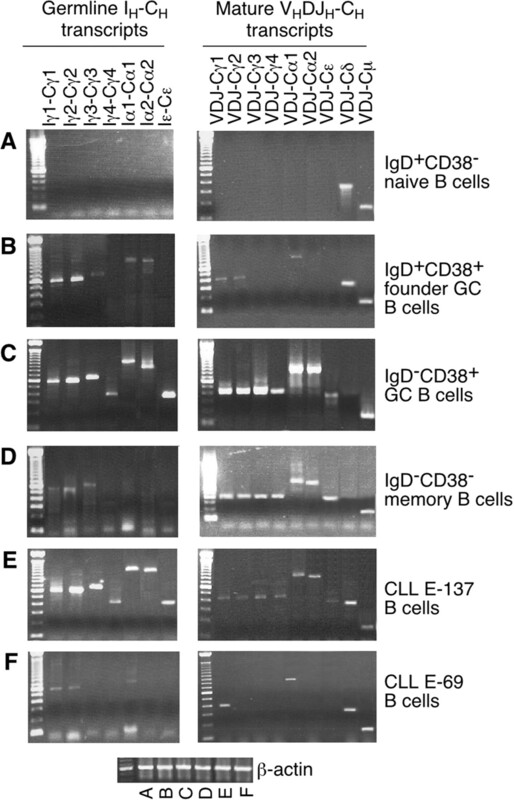 In secondary lymphoid organs, B lymphocytes encompass four distinct populations, including IgD+CD38− naive B cells, IgD+CD38+ founder GC B cells, IgD−CD38+ GC B cells, and IgD−CD38− memory B cells (7, 43, 44). Previous studies indicate that class switching initiates in GC B cells and is completed in memory B cells (9, 43). To determine the differentiation stage at which ongoing direct and sequential CSR occurs, we evaluated the presence of SCs, CTs, and AID (Fig. 1⇓) in normal peripheral blood CD19+ B cells as well as in tonsillar B cell subsets. Total peripheral blood B cells from four healthy subjects did not contain traces of ongoing direct CSR, including Sγ-Sμ, Sα-Sμ, or Sε-Sμ SCs (Fig. 2⇓A); Iγ-Cμ, Iα-Cμ, or Iε-Cμ CTs; and AID transcripts (Fig. 2⇓B). Similar cells lacked markers of ongoing sequential CSR from Cγ to Cα or Cε, including Sγ-Sα and Sγ-Sε SCs and Iα-Cγ and Iε-Cγ CTs. Similarly, tonsil IgD+CD38− and IgD−CD38− B cells did not contain SCs, nor did they express CTs or AID transcripts. In contrast, IgD+CD38+ B cells contained Sγ-Sμ and Sα-Sμ SCs and Iγ-Cμ and Iα-Cμ CTs as well as AID transcripts. As expected, IgD−CD38+ B cells contained Sγ-Sμ, Sα-Sμ, Sε-Sμ, Sγ-Sα, and Sγ-Sε SCs; Iγ-Cμ, Iα-Cμ, Iε-Cμ, Iα-Cγ, and Iε-Cγ CTs; and AID transcripts. These findings indicate that in healthy subjects, ongoing CSR is virtually absent in peripheral blood B cells and segregates within founder GC and GC B cells. Generation and composition of SCs and CTs. The human IgH chain locus and the molecular events involved in switching from Cμ to Cε are shown schematically. Ovals indicate S regions; rectangles before and after the S regions are IH exons and CH gene exons, respectively; iEμ is the IgH chain intronic enhancer; triangles are the 3′ IgH chain enhancers; V-shaped lines indicate splicing; arrowheads indicate the positions and directions of the primers used to amplify SCs, CTs, germline transcripts, and mature transcripts. Normal GC B cells, but not naive and memory B cells, contain SCs and express CTs and AID. Sγ-Sμ, Sα-Sμ, Sε-Sμ, Sα-Sγ, and Sε-Sμ SCs (all ranging from 500-4000 bp; A) as well as Iγ-Cμ (557 bp), Iα-Cμ (666 bp), Iε-Cμ (408 bp), Iα-Cγ (604 bp), and Iε-Cγ (346 bp) CTs (B), and AID (382 bp; B) were amplified from total peripheral blood (PB) CD19+ B cells from four healthy subjects, and from normal tonsillar IgD+CD38− naive (N), IgD+CD38+ founder GC (FGC), IgD−CD38+ GC (GC), and IgD−CD38− memory (M) B cells. Sγ-Sμ, Sα-Sμ, and Sε-Sμ were hybridized with an Sμ probe; Sα-Sγ and Sε-Sμ were hybridized with an Sγ probe; Iγ-Cμ, Iα-Cμ, and Iε-Cμ were hybridized with a Cμ probe; Iα-Cγ and Iε-Cγ were hybridized with a Cγ probe. β-Actin (593 bp) was amplified to control the loading of genomic DNA or cDNA. The results depicted are from one of three experiments yielding similar results. The presence of actively ongoing CSR in CLL remains elusive. We detected SCs in leukemic B cells from 14 of 20 CLLs (70%). Sγ-Sμ SCs were detected in nine of 20 (45%) CLLs, Sα-Sμ SCs in 13 of 20 CLLs (65%), Sε-Sμ SCs in eight of 20 CLLs (40%), Sα-Sγ SCs in seven of 20 CLLs (35%), and Sε-Sγ SCs in four of 20 CLLs (20%; Table I⇓). In some CLLs, including CLL E-28, E-137, and E-92, malignant B cells simultaneously expressed Sγ-Sμ, Sα-Sμ, Sε-Sμ, Sα-Sγ, and Sε-Sγ SCs. The expression of CTs and AID was analyzed in eight of the 14 CLLs containing SCs as well as in four of the CLLs lacking SCs. The leukemic B cells from the eight cases containing SCs also expressed the corresponding CTs and AID transcripts. In contrast, the leukemic B cells from the four patients who lacked SCs and CTs did not express significant AID (Fig. 3⇓). These results demonstrate that in the majority of CLLs at least some members of the leukemic clone display traces of ongoing direct and sequential CSR. Malignant CLL B cells contain SCs and express CTs and AID. Sγ-Sμ, Sα-Sμ, Sε-Sμ, Sα-Sγ, and Sε-Sμ SCs (A); and Iγ-Cμ, Iα-Cμ, Iε-Cμ, Iα-Cγ, and Iε-Cγ CTs and AID (B) were PCR amplified from peripheral blood malignant B cells from 12 CLLs. Two Iγ-Cμ and Iα-Cμ bands represent alternatively spliced transcripts. β-Actin genomic DNA was PCR amplified to control DNA loading. 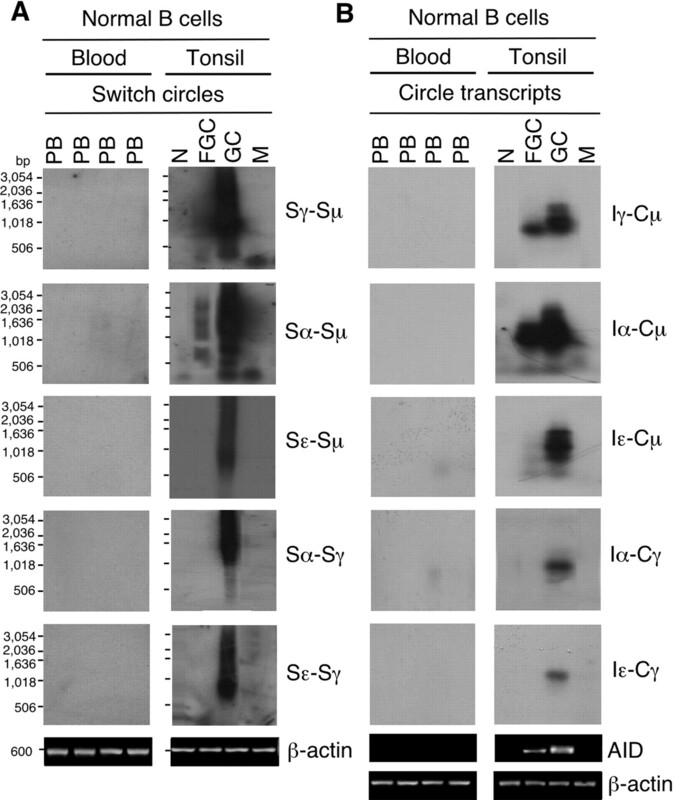 Sγ-Sμ, Sα-Sμ, and Sε-Sμ were hybridized with an Sμ probe; Sα-Sγ and Sε-Sγ were hybridized with an Sγ probe; Iγ-Cμ, Iα-Cμ, and Iε-Cμ were hybridized with a Cμ probe; Iα-Cγ and Iε-Cγ were hybridized with a Cγ probe. In normal B cells, SCs and CTs are extinct a few days after the removal of CSR-inducing stimuli (36). We hypothesized that if CLL B cells undergo CSR in vivo in response to external stimuli, such as CD40L and IL-4, then such leukemic cells should down-regulate CSR once transferred in vitro in the absence of these stimuli. We found that malignant B cells from actively class-switching CLLs, including CLL E-137, still express Sγ-Sμ and Iγ-Cμ after incubation in vitro for 1 day in medium alone (Fig. 4⇓). Sγ-Sμ SCs and Iγ-Cμ CTs were down-regulated after 2 days and became undetectable after 3 and 4 days. The down-regulation of SCs and CTs was not associated with a significant decrease in CLL B cell proliferation and apoptosis (not shown) and could be prevented by exposing leukemic cells to htCD40L and IL-4. Thus, in CLL patients, ongoing CSR would result from the in vivo exposure of neoplastic cells to external stimuli, possibly including CD40L and IL-4. Malignant CLL B cells down-regulate SCs and CTs after transferring in vitro. Total Sγ-Sμ SCs and Iγ-Cμ were PCR amplified from purified CLL E-137 B cells incubated in medium alone (control) or in medium containing htCD40L and IL-4 for 1, 2, 3, or 4 days. β-Actin was PCR amplified to control DNA loading. Data shown are from one representative experiment of three performed yielding similar results. In normal B cells the induction of CSR is associated with complex phenotypic changes. Before their stimulation by Ag and CD4+ T cells, B cells express a naive phenotype, which includes surface IgM, IgD, and CD44, but not IgG, IgA, CD38, CD71, and CD77 (7, 9, 43). After stimulation, these naive B cells differentiate to founder GC B cells, which down-regulate CD44 and up-regulate CD38, CD71, and CD77 (44). Further differentiation of founder GC B cells to GC centroblasts is associated with down-regulation of IgM and IgD and up-regulation of CD77 (7, 9, 43). Centroblasts then give rise to GC centrocytes, which complete CSR, lack IgM and IgD, up-regulate IgG or IgA, and down-regulate CD77 (7, 9, 43). Centrocytes differentiate to either memory B cells, which re-express CD44 but down-regulate CD38 (7, 9, 43), or plasmacytoid cells, which acquire CD138 (syndecan-1) and further up-regulate CD38 (45, 46). We sought to verify whether some of these phenotypic changes are also detectable in actively class-switching CLL B cells, such as CLL E-123. 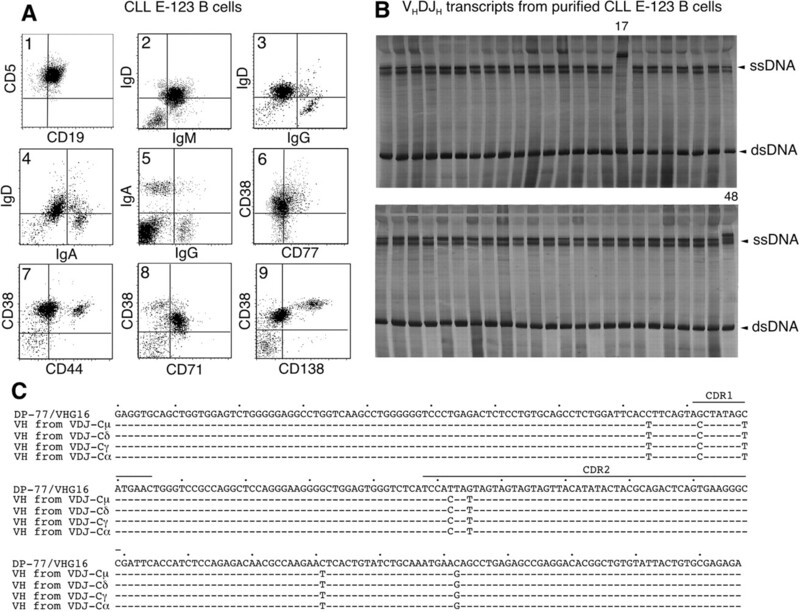 Purified CLL E-123 B cells were homogeneously CD5+CD19+ (Fig. 5⇓A, panel 1). These cells comprised a dominant IgM+IgD+ population as well as an IgM−IgD− subpopulation that included IgG+IgA− and IgG−IgA+ cells (Fig. 5⇓A, panels 2–5). The class-switched neoplastic elements accounted for 4 and 7% of the leukemic clone, respectively. Two additional IgD+IgG+ and IgD+IgA+ fractions, possibly representing a transitional stage from non-class-switched to class-switched cells, were also detectable. Furthermore, a dominant CD38+CD44low/−CD71+CD77− population coexisted with CD38+CD77+, CD38−CD77−, CD38+CD44+, and CD38highCD138+ fractions (Fig. 5⇓A, panels 6–9). An intraclonal phenotypic diversification similar to that observed in CLL E-123 was observed in other in vivo class-switching CLLs, including CLL E-48, E-101, E-92, and E-137 (not shown). In contrast, CLL E-69 and CLLE-73, which do not class switch in vivo, expressed a more homogeneous phenotype (not shown). These findings indicate that some CLLs undergo intraclonal phenotypic diversification. Actively class-switching malignant CLL B cells comprise clonally related, but phenotypically distinct, subsets. A, CD19, CD5, IgM, IgD, IgG, IgA, CD38, CD77, CD44, CD71, and CD138 (syndecan-1) on purified CLL E-123 B cells. B, SSCP of 48 VHDJH transcripts from purified CLL E-123 B cells. The electrophoretic migration profiles of dsDNA and ssDNA are indicated. C, Nucleotide VH sequences of VHDJH-Cμ, -Cδ, -Cγ, and -Cα cDNAs from purified CLL E-123 B cells. The top sequence corresponds to the germline VH3 gene DP77/VHG16 to which leukemic VH sequences were compared. Dashes indicate identities. Solid lines depict complementary-determining regions (CDRs). The monoclonality of CLL B cells undergoing in vivo CSR was confirmed by the homogeneous electrophoretic mobility profile of the dsDNA bands of 48 VHDJH transcripts after SSCP analysis, as exemplified by CLL E-123 (Fig. 5⇑B). In addition, the nucleotide sequences of VHDJH-Cμ, -Cδ, -Cγ, and -Cα transcripts were collinear and displayed the same differences as the putative germline template (Fig. 5⇑C). This indicates that in CLL E-123, surface IgG and IgA are clonally related to the IgM and IgD expressed by the dominant population. As recently reported (20), CLLs, including actively class-switching CLL N-105, N-169, N-178, and N-249, can display a variable degree of intraclonal Ig VHDJH gene diversity. 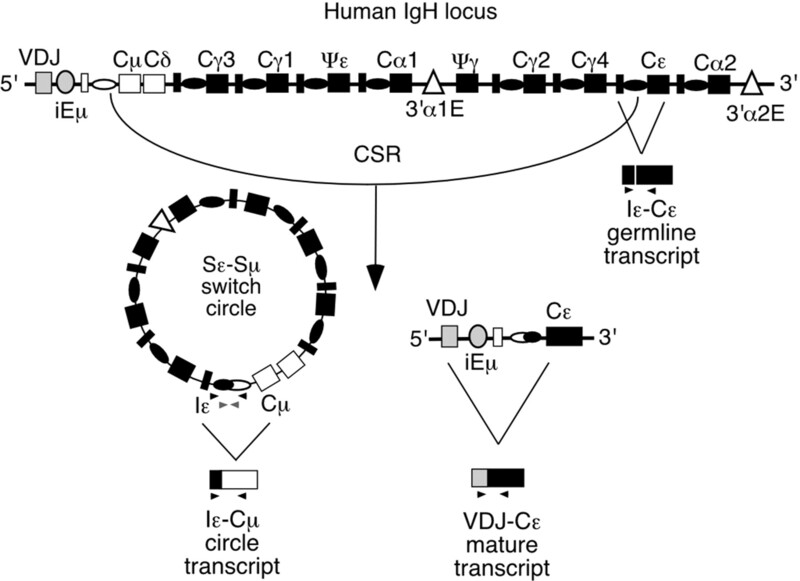 This is shown by the inconsistent mobility profile of some single-strand Ig VHDJH transcripts. Consistent with this, the mobility profile of single-strand VHDJH transcripts 17 and 48 from CLL E-123 was different from that of the dominant population (Fig. 5⇑B). DNA sequencing showed that these differences reflect the presence of two intraclonal VHDJH gene point mutations (not shown). In agreement with previous reports documenting the independence of CSR and Ig V(D)J gene somatic hypermutation in both normal and neoplastic CD5+ B cells (24, 26, 47), intraclonal Ig VHDJH diversification did not correlate with ongoing class switching, as nonactively class-switching CLL E-69, E-73, E-130, and N-261 displayed intraclonal diversification, but not CSR (20) (data not shown). The transcriptional status of the Ig H chain locus was analyzed in well-characterized B cell subsets and CLL B cells. IgD+CD38− naive B cells lacked germline IH-CH transcripts and expressed only VHDJH-Cμ and VHDJH-Cδ mature transcripts (Fig. 6⇓). Compared with these cells, normal IgD+CD38+ founder GC B cells up-regulated germline Iγ1-Cγ1, Iγ2-Cγ2, Iγ3-Cγ3, Iα1-Cα1, and Iα2-Cα2 transcripts and expressed mature VHDJH-Cγ1, -Cγ2, -Cα1, and -Cα2 transcripts. IgD−CD38+ GC B cells further up-regulated all downstream germline transcripts, including Iγ4-Cγ4 and Iε-Cε, as well as all downstream mature transcripts, including VHDJH-Cγ4 and Cε. Finally, IgD−CD38− memory B cells contained all downstream mature transcripts, but only weakly germline Iγ1-Cγ1, Iγ2-Cγ2, and Iγ3-Cγ3 transcripts. The transcriptional status of the Ig H chain locus in actively class-switching malignant CLL B cells is similar to that of nonmalignant GC B cells. Iγ1-Cγ1 (603 bp), Iγ2-Cγ2 (597 bp), Iγ3-Cγ3 (670 bp), Iγ4-Cγ4 (411 bp), Iα1-Cα1 (1194 bp), Iα2-Cα2 (1181 bp), Iε-Cε (409 bp), VHDJH-Cμ (∼150 bp), VHDJH-Cδ (∼350 bp), VHDJH-Cγ1 (∼415 bp), VHDJH-Cγ2 (∼415 bp), VHDJH-Cγ3 (∼415 bp), VHDJH-Cγ4 (∼415 bp), VHDJH- Cα1 (∼900 bp), VHDJH-Cα2 (∼890 bp), and VHDJH-Cε (∼380 bp) were PCR amplified from normal IgD+CD38− naive (A), IgD+CD38+ founder GC (B), IgD−CD38+ GC (C), and IgD−CD38− memory (D) tonsillar B cells. Similar cDNAs were also amplified from actively class-switching CLL E-137 (E) and nonactively class-switching CLL E-69 (F) B cells. Data shown are from a representative experiment of four performed yielding similar results. Malignant B cells from actively class-switching CLLs strongly expressed germline and mature transcripts, with Cγ1, Cγ2, Cγ3, and Cα1 being the most frequently targeted downstream CH genes. Some of these CLLs, including CLL E-137, expressed all downstream germline and mature transcripts (Fig. 6⇑). Although expressing multiple downstream mature transcripts, including VHDJH-Cγ1, Cγ2, Cγ3, and Cα1, the malignant B cells from nonactively switching CLLs weakly expressed germline IH-CH transcripts. For instance, CLL E-69 B cells weakly expressed germline Iγ1-Cγ1 and Iγ2-Cγ2 transcripts in addition to producing VHDJH-Cμ, -Cδ, -Cγ1, and -Cα1 mature transcripts. These findings indicate that, like nonmalignant GC B cells, actively class-switching leukemic B cells can express germline and mature Ig transcripts derived from multiple downstream Cγ, Cα, and Cε genes. Some CLLs may not class switch in vivo because the transforming event may have altered the physiological CSR-inducing signaling pathway. In normal B cells, CD40 engagement elicits the recruitment of activated TRAF adapter proteins to the CD40 cytoplasmic tail (48). By activating downstream kinases, including IKKα, the CD40-TRAF complex induces nuclear translocation of NF-κB (49), which, together with IL-4R-induced STAT-6, activates the IH promoter and induces IH-CH germline transcription and, eventually, CSR (30). 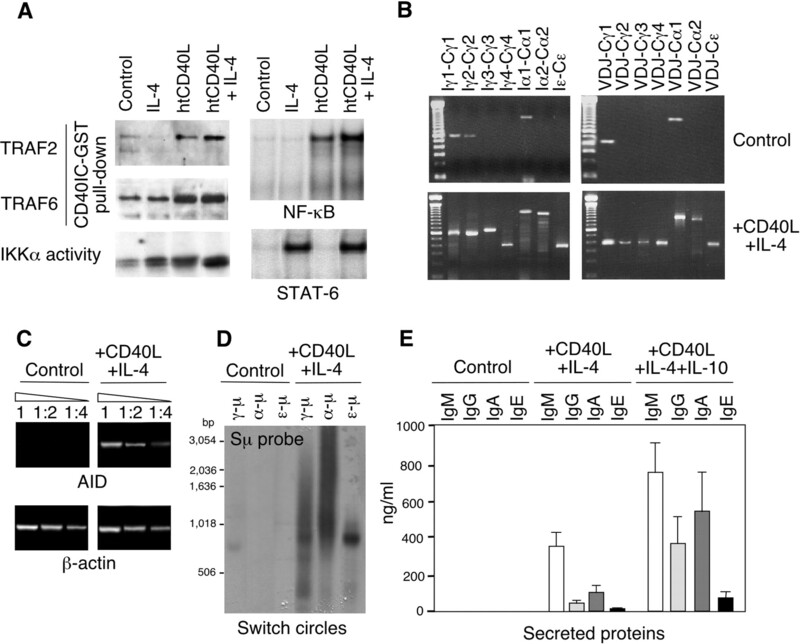 Malignant B cells from non-class-switching CLLs, including CLL E-69, up-regulated the binding of TRAF-2 and TRAF-6 to a construct encompassing the CD40 cytoplasmic tail and enhanced the activity of IKKα upon exposure to htCD40L alone or with IL-4 (Fig. 7⇓A). Under similar conditions, CLL E-69 B cells up-regulated the binding of NF-κB to a DNA sequence encompassing the CD40-responsive element of the Cγ3 gene promoter (30). In the presence of htCD40L and/or IL-4, CLL E-69 B cells induced the binding of STAT-6 to a DNA sequence encompassing the IL-4-responsive element of the Cγ3 gene promoter (30). Similar results were obtained with CLL E-60, E-73, and N-105 (not shown). Thus, both CD40 and IL-4 receptors are functional in CLL B cells that do not class switch in vivo. Malignant CLL B cells that are not actively class switching in vivo undergo CSR upon exposure to CD40L and IL-4 in vitro. A, CLL E-69 B cells were incubated with medium only or with htCD40L and/or IL-4 for two hours. Left panels, Total proteins were pulled down with GST-CD40IC and immunoblotted for TRAF-2 and TRAF-6; the IKKα activity was assessed using IκBα-GST as substrate. Right panels, Binding of nuclear proteins to radiolabeled oligonucleotides encompassing the NF-κB and STAT-6 binding sites within the human Cγ3 promoter. B–D, Germline and mature transcripts, AID, β-actin, and SCs before and after CLL E-69 B cell incubation with medium only (control) or htCD40L and IL-4 for 4 days. AID and β-actin cDNAs were diluted with water (1/1, 1/2, and 1/4) before amplification. E, IgM, IgG, IgA, and IgE secretion after CLL E-69 B cell incubation with medium only (control), htCD40L and IL-4, or htCD40L, IL-4, and IL-10 for 7 days. Data shown are from a representative experiment of four performed yielding similar results. We also evaluated whether malignant B cells undergo CSR upon exposure to CD40L and IL-4. Compared with unstimulated CLL E-69 B cells, htCD40L- and IL-4-stimulated CLL E-69 B cells up-regulated Iγ1-Cγ1, Iγ2-Cγ2, Iγ3-Cγ3, Iα1-Cα1, Iα2-Cα2, and Iε-Cε germline transcripts as well as VHDJH-Cγ1, -Cγ2, -Cγ3, -Cγ4, -Cα1, -Cα2, and -Cε mature transcripts (Fig. 7⇑B). 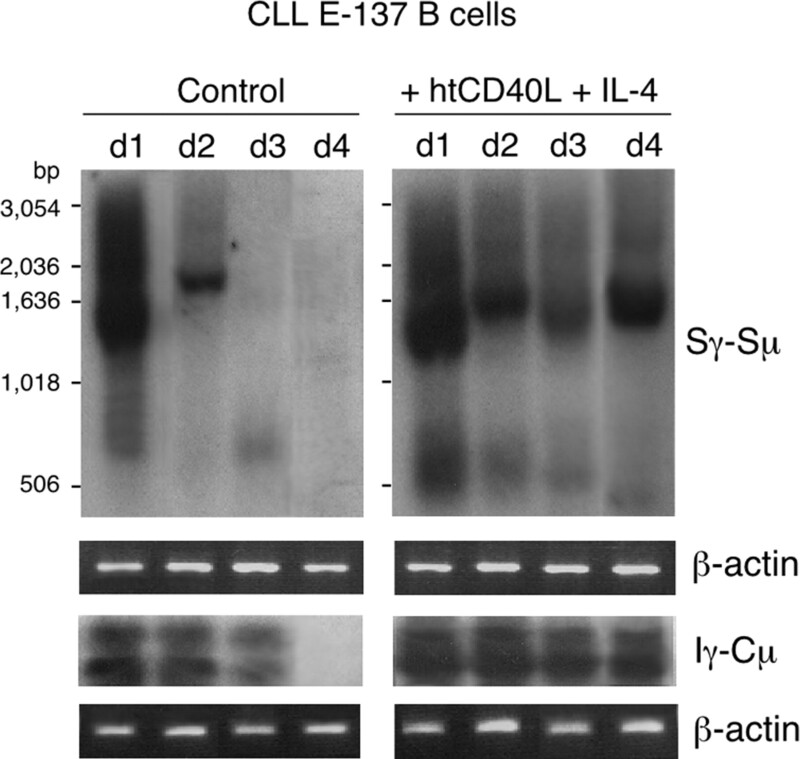 Similarly activated CLL E-69 B cells induced also AID as well as Sγ-Sμ, Sα-Sμ, and Sε-Sμ SCs (Fig. 7⇑, C and D). Interestingly, malignant B cells from CLLs with ongoing switching to Cγ, including CLL E-101 and E-123, underwent sequential switching to Cα and/or Cε upon exposure to htCD40L and IL-4 (not shown). Finally, htCD40L and IL-4-stimulated CLL E-69 B cells induced IgM, IgG, IgA and IgE secretion, which was further enhanced by IL-10 (Fig. 7⇑E). Thus, nonactively class-switching CLL B cells undergo CSR and Ab secretion upon exposure to external physiological stimuli, including CD40L, IL-4, and IL-10. The CLL phenotype has been intensively investigated, and new evidence indicates that CLL B cells display a gene signature similar to that of memory B cells (17, 18, 42, 50, 51). It remains unclear whether CLLs further diversify their phenotype in response to environmental stimuli. We show here that in the majority of CLLs at least some members of the malignant clone display ongoing direct and sequential CSR to Cγ, Cα, and/or Cε genes in vivo. These cells turn off the CSR machinery in vitro, but reactivate it upon exposure to exogenous CD40L and IL-4. Our findings indicate that IgM+IgD+ CLLs are not developmentally static, but actively differentiate in vivo along a maturation pathway that includes direct and sequential CSR to multiple downstream CH genes. This differentiation process may be elicited by external stimuli as provided by bystander immune cells. Previous reports show that IgM+ CLLs can give rise in vivo to class-switched elements expressing clonally related IgG or IgA (12, 21, 22, 23, 24, 25, 26). However, these studies do not clarify whether class switching occurs at a given time point during the evolution of the neoplastic clone or, rather, represents a dynamic process. By showing that freshly isolated CLL B cells contain SCs, CTs, as well as multiple downstream germline IH-CH and mature VHDJH-CH transcripts, our results demonstrate that Ig class switching stems from the continuous in vivo stimulation of the leukemic CSR machinery. They also suggest that CSR occurs in some, but not all, members of the CLL clone, as only discrete neoplastic fractions express IgG or IgA, but lack IgM and IgD. This intraclonal phenotypic diversification presumably reflects the heterogeneous accessibility of the different components of the neoplastic clone to CSR-inducing stimuli. Alternatively, only some elements of a given CLL clone might be competent to respond to these CSR-inducing stimuli. Ongoing CSR does not imply that the CLL clone derives from a normal GC B cell precursor. Rather, it suggests that some members of the clone differentiate in response to either intrinsic or environmental stimuli. Our findings support this latter interpretation, as CLL B cells that actively class switch in vivo turn off the CSR machinery once transferred in vitro unless exposed to CD40L and IL-4. The possible relevance of external CD40L and IL-4 in the evolution of the CLL clone is supported by studies showing that freshly isolated CLL B cells express increased nuclear NF-κB (52), display a phenotype similar to that of recently activated B cells (18, 53), and are enriched in genes related to the IL-4R signaling pathway (17). Furthermore, CLL B cells proliferate, secrete Igs, and are rescued from apoptosis upon in vitro exposure to CD40L and/or IL-4 (25, 52, 54, 55, 56). CLL B cells might be exposed to CD40L and IL-4 in the context of leukemic pseudofollicles, also known as proliferation centers, which have been recently shown to be extensively infiltrated by activated CD4+ T cells. These T cells would colonize the pseudofollicle by navigating through a chemoattractive gradient established by CLL B cell-derived chemokines, including CCL22 (57). Alternatively, CLL B cells could be activated by CD40L and IL-4 as they transit through the GC of a reactive secondary lymphoid follicle. Consistent with this, certain CLLs are characterized by an interfollicular proliferation pattern in which the neoplastic B cells surround and sometimes colonize large reactive lymphoid follicles (58). By favoring the interaction of CLL B cells with CD4+ T cells and an as yet elusive Ag(s) (20, 53, 59), the GC milieu within the secondary follicle would constitute an ideal microenvironment to foster Ig CSR, plasmacytoid differentiation as well as bcl-6 and V(D)J gene somatic hypermutation (12, 19, 20) in at least some members of the leukemic clone. In addition to actively diversifying their Ig CH gene repertoire through CSR, some CLLs intraclonally diversify their surface phenotype. As exemplified by case CLL E-123, this in vivo differentiation process can give rise to CLL fractions that express the GC B cell markers CD38 and CD77, but lack (not shown) the naive B cell markers CD44 and IgD. These GC-like CLL B cells might include the morphologically atypical elements, such as immunoblastic and Hodgkin/Reed-Sternberg-like cells, which can be found in a background of otherwise typical small round elements within the pseudofollicles of certain CLLs (60, 61). Similar to the CD38+CD77+ GC-like cells shown in this study, atypical CLL B cells are clonally related to the dominant CLL population and express GC-like phenotypic and genotypic traits (60, 61). As shown by others (51), we found that transcripts for the GC B cell marker Bcl-6 as well as the Bcl-6 protein were consistently expressed by CLLs with significant CD38+CD77+ GC-like cells, although at lower levels than in GC B cells (not shown). This might reflect the attempt of some members of the CLL clone to progress along a GC differentiation pathway that includes CSR. It is tempting to speculate that in the presence of additional leukemogenic events, including EBV infection, atypical GC-like CLL B cells become the precursors of a second lymphoid neoplasia clonally related to the original CLL (21, 60, 61). The possibility remains that the members of the CLL clone that class switch in vivo follow a maturation pathway distinct from that of a classical GC B cell. This view is supported by studies showing that B cells, including CD5+ B cells and marginal zone B cells, undergo CSR and somatic hypermutation outside the GC without the help of CD4+ T cells and in a CD40L-independent fashion (62, 63, 64, 65). Regardless of the T cell-dependent or T cell-independent nature of the CSR-inducing stimuli, our findings strongly indicate that some members of the CLL clone actively differentiate in vivo in response to external stimuli. Consistent with reports showing accumulation of monoclonal Igs in the plasma and urine of some patients (21, 66), some of the CLLs with ongoing CSR include elements resembling typical plasma cells. In addition to expressing CD38 and CD138 (syndecan-1), these cells contain large amounts of cytoplasmic Igs as well as transcripts for Blimp-1 (not shown), a transcription factor involved in the progression of activated B cells to plasma cells (67, 68). Our findings extend previous reports suggesting that some CLL B cells retain the ability to undergo plasmacytoid differentiation in response to exogenous stimuli including Ag and cytokines (69). In the presence of additional transforming events, these plasmacytoid CLL B cells might give rise to a multiple myeloma clonally related to the original CLL (70). The lack of ongoing CSR in certain CLLs, such as case CLL E-69, could derive from their unresponsiveness to exogenous stimuli due to genetic alterations caused by the leukemogenic event. This hypothesis appears unlikely, as neoplastic B cells from CLL E-69 and other nonactively class-switching CLLs activate TRAFs and IKKα and induce nuclear translocation of NF-κB and STAT-6 upon in vitro exposure to CD40L and IL-4. Together with IL-10, these stimuli induce germline IH-CH transcription, CSR, and IgG, IgA, and IgE production in CLL B cells. An alternative explanation for the absence of ongoing CSR in certain CLLs might be that external CSR-inducing stimuli, namely CD40L, are not accessible to the leukemic cells. Consistent with this, in some patients CD4+ T cells express less CD40L as a result of an inhibitory effect mediated by the malignant B cells (39, 71). In agreement with reports indicating that IgA is the most represented secondary isotype in normal and leukemic CD5+ B cells (24, 26, 72), we found that CSR from Cμ to Cα occurs more frequently than CSR from Cμ to Cγ or Cε in CLL B cells. This could be related to the increased propensity of CLL B cells to produce and respond to TGF-β (17, 73), a cytokine inducing switching to IgA (27, 29). A smaller, but significant, proportion of CLLs actively undergo direct CSR from Cμ to Cε or (not shown) Cγ4 as well as sequential CSR from Cγ to Cε. Given the well-known dependence of both IgE and IgG4 production on IL-4, our findings suggest that in some cases, the leukemic clone is chronically exposed in vivo to an IL-4-rich environment (27). This interpretation would be consistent with recent studies showing that in CLL patients, T cells produce more IL-4 (39) and malignant B cells express more IL-4R but less suppressor of cytokine signaling 1, an inhibitor of IL-4 receptor signaling (17). The ongoing CSR in some leukemic B cells contrasts with the severe impairment of IgG and IgA production by nonmalignant B cells (74). This acquired immune deficiency leads to recurrent infections and is thought to be secondary to the abnormal expansion of T cells with CSR inhibitory activity, including CD8+CD28−CD30+ and CD4+CD28+CD30+ T cells (39, 40). These latter constitutively express CD25 and might include CD4+CD25+ T cells, a regulatory subset that inhibits both humoral and cellular immune responses (75). Several mechanisms would account for the inhibition of CSR in normal rather than in leukemic B cells. By selectively attracting CD4+CD40L+ T cells through chemokines (57), CLL B cells might sequester Th cells and generate an imbalance between helper and suppressor T cells within the leukemic and normal B cell compartments. In addition, by progressively outnumbering nonmalignant B cells in secondary lymphoid follicles, CLL B cells might become the only elements effectively exposed to external CSR-inducing stimuli. Our findings have important biological implications, as the same stimuli that actively induce CSR, such as CD40L and IL-4, may enhance the in vivo accumulation of some elements of the CLL clone (52, 54, 56). Furthermore, ongoing CSR might introduce genomic instability. This together with EBV infection, immunosuppression, and chemotherapy-induced DNA damage could play an important role in the emergence of a new neoplasia clonally related to CLL, such as large cell non-Hodgkin’s lymphoma, as in Richter’s syndrome, Hodgkin’s lymphoma, or multiple myeloma (61, 70, 76, 77, 78). Thus, markers of ongoing CSR and plasmacytoid differentiation could be combined with other parameters, including Ig V(D)J gene somatic hypermutation, to better define CLL prognostic subgroups and, perhaps, identify patients at risk of developing a second lymphoid tumor. We thank Dr. Nicholas Chiorazzi (North Shore-Long Island Jewish Research Institute, Manhasset, NY) for providing us with CLL N-105, N-169, N-178, N-216, N-249, and N-261; Kathleen S. Picha (Immunex, Seattle, WA) for htCD40L; Dr. Vishva M. Dixit (Genentech, San Francisco, CA) for CD40IC-GST; and Dr. M. Karin (University of California, San Diego, CA) for IκBα-GST. ↵1 This work was supported by U.S. Public Health Service National Institutes of Health Grant AR47872, a New Investigator Grant from the Leukemia Research Foundation, and a Career Development Award from the S.L.E. Foundation (to A.C.) and by U. S. Public Health Service National Institutes of Health Grants AI45011, AG13910, AR40908, and AI07621 (to P.C.). ↵3 Abbreviations used in this paper: CLL, chronic lymphocytic leukemia; AID, activation-induced cytidine deaminase; CD40L, CD40 ligand; CSR, class switch DNA recombination; CT, circle transcript; GC, germinal center; GST-CD40IC, GST-intracytoplasmic CD40 fusion protein; ht, human trimeric; IH-CH, Ig germline transcript; IKKα, IκBα kinase; S, switch region; SC, switch circle; SSCP, single-stranded conformation polymorphism; TRAF, TNFR-associated factor; VHDJH-CH, Ig mature transcript. Kipps, T.. 1995. Chronic lymphocytic leukemia and related disorders. E. Beutler, and M. A. Lichtman, and B. S. Coller, and T. J. Kipps, eds. William’s Hematology 1017 McGraw-Hill, New York.